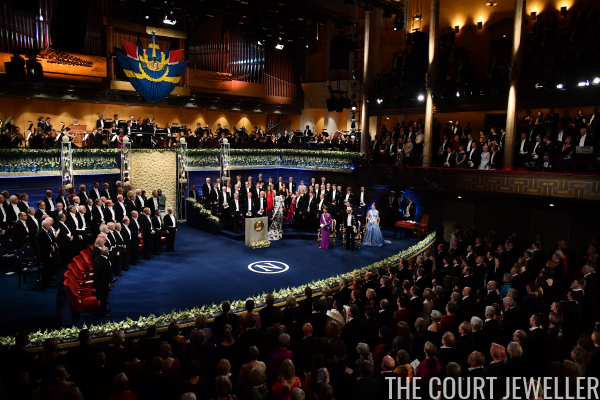 The tiara festivities for the annual Nobel Prizes in Stockholm continued on Monday with the King's Dinner. Here's a look at what the senior royal ladies wore for the event! Queen Silvia selected her other go-to Nobel jewelry suite for the King's Dinner: the Leuchtenberg Sapphires. Crown Princess Victoria wore a tiara that she now owns personally, the Boucheron Laurel Wreath Tiara, with diamonds, including the same diamond floral earrings that she wore on Sunday. Princess Madeleine also wore her own tiara, the Modern Fringe Tiara, which she paired with pearl earrings and a pearl and diamond brooch. And Princess Sofia showed the versatility of her wedding tiara once again, wearing it with the emerald toppers on the new, more open frame.